Novitec’s history in exotic cars goes back to the late Eighties when its founder Wolfgang Hagedorn first brought his creativity and unique vision to fruition. The brand’s earliest masterpieces gave way to an entirely new market of highly-modified Italian sports cars. From one of their first high-end projects, a 565 hp Ferrari 360 which saw considerable performance gains from the 400 hp stock configuration, to the popular 2007 announcement of the company’s vision to supercharge a Ferrari 599 to nearly 900 hp, Novitec has remained a predominant player in the modified sports car market for several decades. Headquartered in Stetten, Germany with branches across the globe, Novitec’s reputation for high-performance automotive augmentation is well known amongst motorsports enthusiasts and exotic car owners alike. 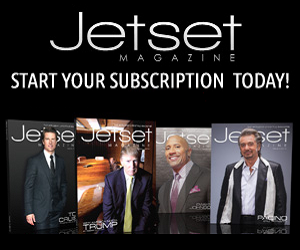 Working exclusively with a handful of distinct manufacturers, their masterfully engineered designs can be found on many of today’s hottest models. Having already worked on a range of Ferrari, Lamborghini, Maserati, and Rolls-Royce vehicles, we had no doubt that when Novitec got their hands on this McLaren 570S Coupé the final product would be nothing short of perfection. 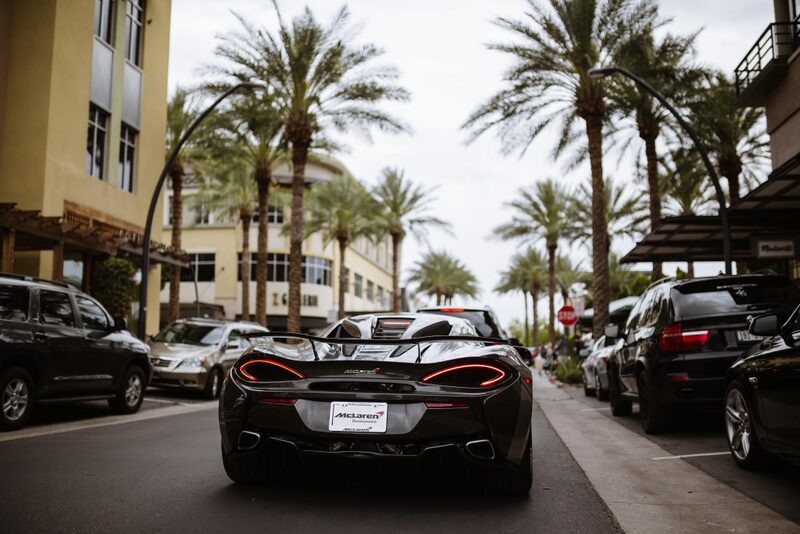 McLarens have long been regarded for their unique appearance and ridiculously fast performance. 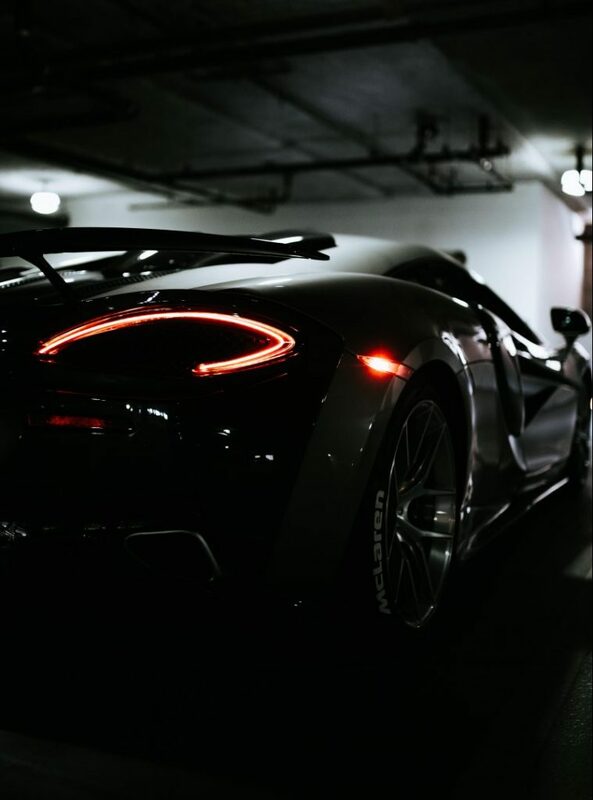 The brand is synonymous with racing excellence (the automaker’s esteemed line of McLaren models are often referred to as “street legal race cars”), but the 570S is truly a work of art on its own. With a twin-turbo charged, 3.8L V8 motor and aerodynamics reminiscent of something out of a futuristic sci-fi thriller, the sports car delivers more than enough torque to leave even the most experienced driver completely speechless. 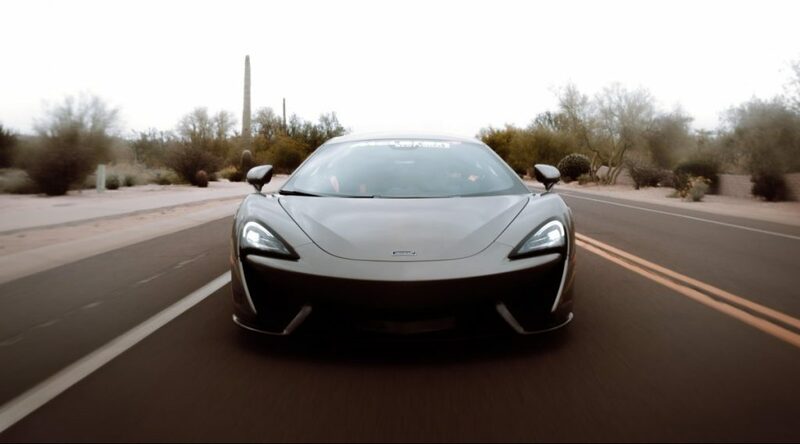 Thanks to our friends at McLaren Scottsdale, I had the unique opportunity of taking this exquisite machine for an extended test drive and the results were mind-boggling. As if the vehicle weren’t astonishing enough from the factory, Novitec’s custom McLaren 570S far exceeded any preconceived notions I had of how the car might perform and I was pleasantly surprised with the torque and handling capabilities. The impressive 0-60 time of 2.9 seconds was immediately apparent and the noise produced from the twin-turbos spooling up in concert gave the model a true race car sound and feel. It’s a custom sports car I would add to my personal collection in a heartbeat. 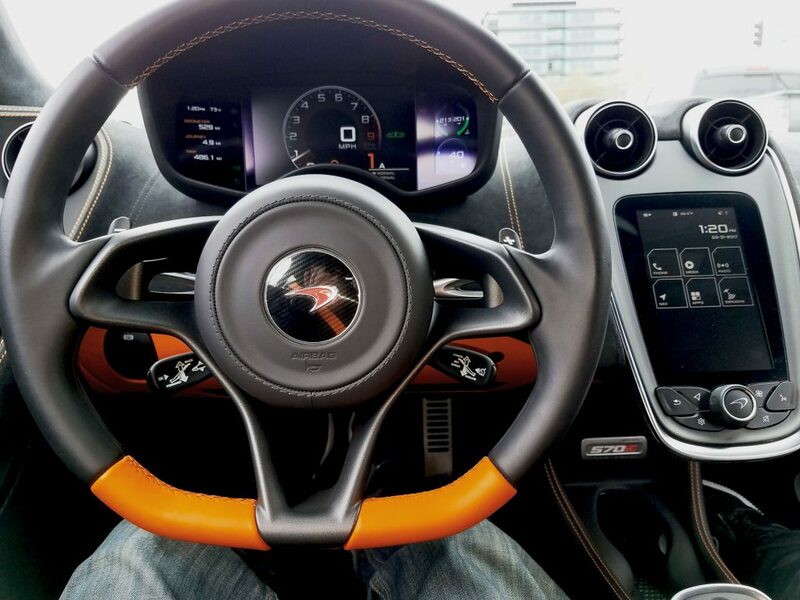 From the car’s stylish, one-of-a-kind interior to the superior performance found only in a McLaren, the 570S does much more than just meet the expectations of well-versed sports car fanatics like myself. A simple push of the ignition button awakens the engine’s unparalleled roar, eliciting more than enough excitement to motivate aspiring exotic car owners to “start their savings.” A seven-speed gearbox with paddle shifters contributes to a variety of driving modes to further elaborate on the 570’s unique handling abilities, while the all-aluminum engine block has been precisely tuned to compete with the likes of its rival: the infamous Porsche 911 Turbo S.
Exploring the interior of the McLaren 570S offers quite an experience in and of itself. A myriad of electronic components and meticulously designed features can be used to adjust every aspect of the car’s handling and performance abilities. The brightly-illuminated LCD screen adjusts settings based on driving mode to deliver driving conditions and operating information in a cutting-edge multi-format display. 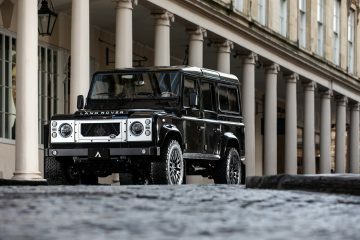 Pair that with the “floating” center console’s seven-inch touchscreen infotainment system and the entire command center of the UK’s foremost exotic racing brand is readily at your fingertips. Additionally, the interior color scheme and trim options can all be completely customized to suit any taste. 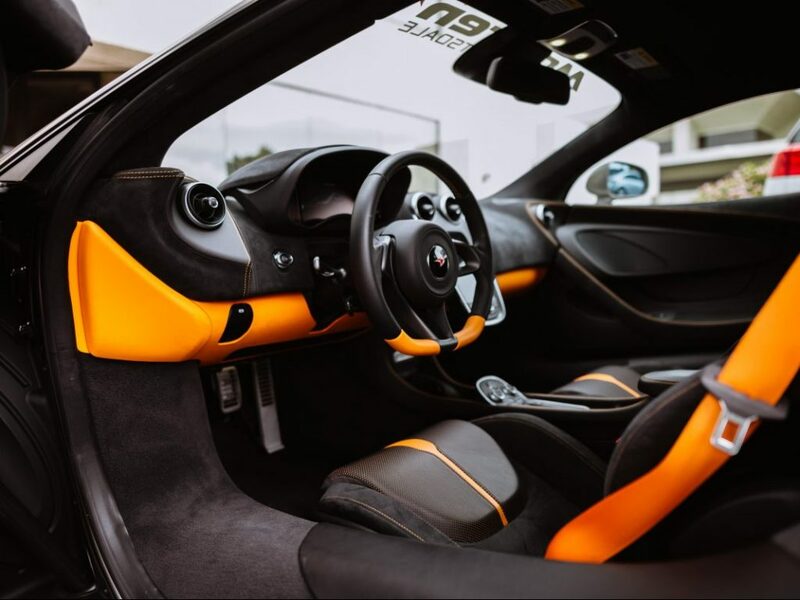 From 10 designer interiors exclusively tailored for McLaren, to the ability to color-match anything you can imagine via their McLaren Special Operations (MSO) division, you’re guaranteed to receive the exact options and aesthetics you’re looking for. An optional, 12-speaker, 1,280-watt surround sound system is also available for the avid audiophile interested in the exotic 570S, a feature not usually offered in today’s high-end sports cars. Addressing one of the very few complaints drivers have ever lodged at McLaren, the company’s design team has also made one very significant adjustment by making the 570 substantially easier to enter and exit than previous models. 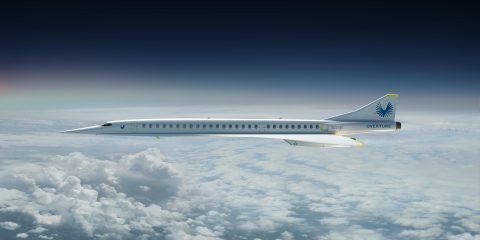 This fix was much needed given the high and wide door sills found on the 650 models, and made getting in and out of the thrilling machine as easy as possible. 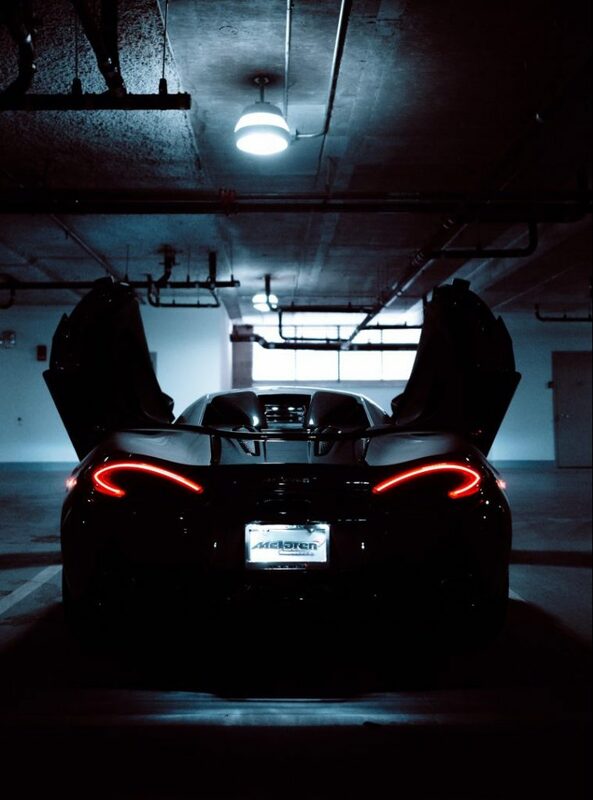 The McLaren 570’s lightest-in-class curb weight and highest power-to-weight ratio demonstrate that the model’s performance has been precisely engineered to exceed expectations of critics and enthusiasts alike across the globe. Largely in part to the carbon fiber MonoCell II chassis — a design element shared by its McLaren F1 relatives —the 570S is capable of moving from zero to 124 mph in an astonishing 9.5 seconds from the power created by its mid-mounted V8 powertrain. Adaptive dampers and anti-roll bars work together with the car’s double wishbone suspension for an impressively smooth ride and superior handling. Couple that with the 570’s hydraulic steering and you’re left with astounding cornering and road-course performance. As with any McLaren, aerodynamics play an important role in the 570S and provide much more than just aggressive styling and exotic flair. 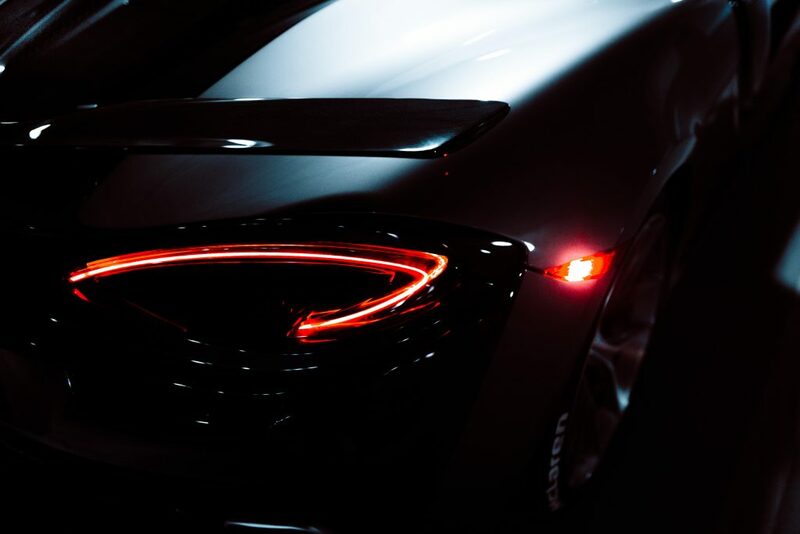 The P1-inspired LED tail lights and use of open mesh throughout the rear end design perfectly accentuate the ultra-sporty “floating” diffuser which helps to create a significant amount of downforce. McLaren’s signature dihedral door design adds just the right amount of jaw-dropping appeal to warrant any crowd’s attention and helps streamline air flow into the wing-like air intakes that have been strategically built into the rear fenders; while lightweight alloy wheels and a pair of flying rear buttresses have been used in the design for additional rear downforce and increased performance; and a hydraulic lift is used in unison with McLaren’s first non-hydraulic suspension system to raise the nose just enough for pulling into a moderate incline or driveway — a feature more than necessary given the model’s low ground clearance. For Novitec’s part, a complete wind tunnel-tested aerodynamic package has been designed in lightweight carbon fiber to offer optimized aerodynamics and an even more aggressive appearance. Carefully shaped and designed so as not to take away from the fundamentals of McLaren’s world-class engineering, Novitec’s lightweight carbon fiber aero kit for the 570S includes a front lip spoiler, side rocker panels, covers for side air-intake vents, rear-bumper side covers, an aggressive rear wing, and a dual-branch rear window air box for increased airflow to the engine bay. 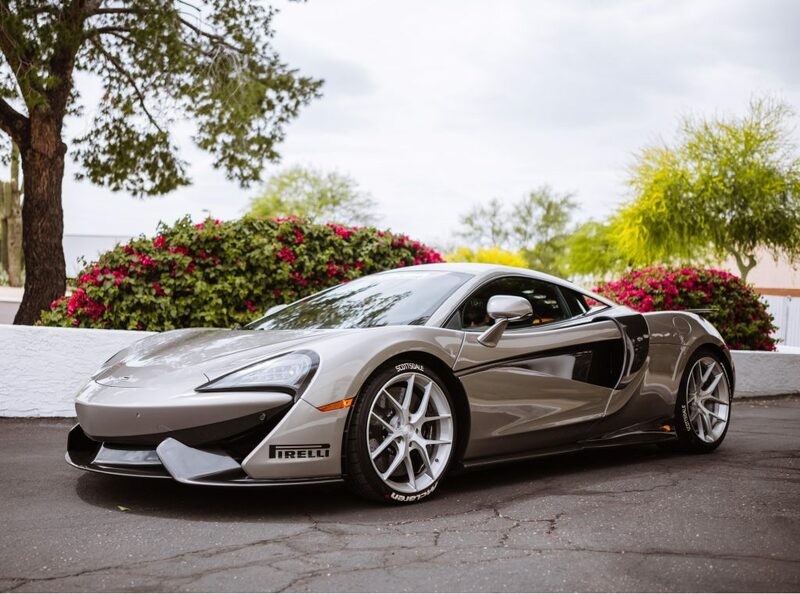 Bespoke wheel and tire treatments from McLaren Scottsdale coincide with customized suspension components to provide additional enhancements, while Novitec’s optional three-stage engine tuning gives 570S owners the opportunity to add an extra 76 hp to their inherently powerful stock configuration with upgraded engine management software and premium quality exhaust systems. After spending some time with the 570S, I found it hard to return to the dealership. Everything about this car — from the handling to the responsiveness to the level of control it gives the driver — exemplifies exactly what I love about precision high-performance automobiles. 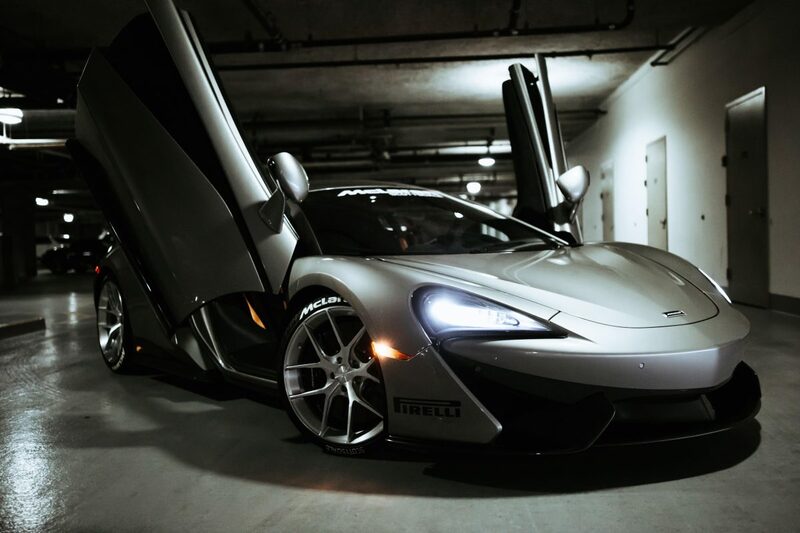 Moral of the story: McLarens are already incredible as is. But add some Novitec customization and you’re left with a piece of automotive mastery that’s second to none. 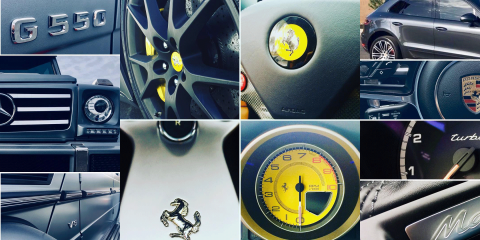 If you are looking for your next supercar, your search may be over.